This is my kind of cake. 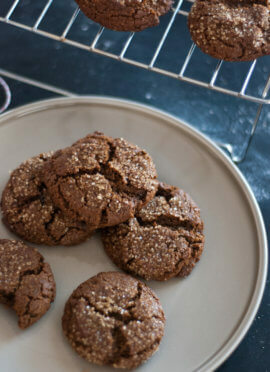 The inside is naturally sweetened with honey and molasses, and spiced with my favorite warming spices. 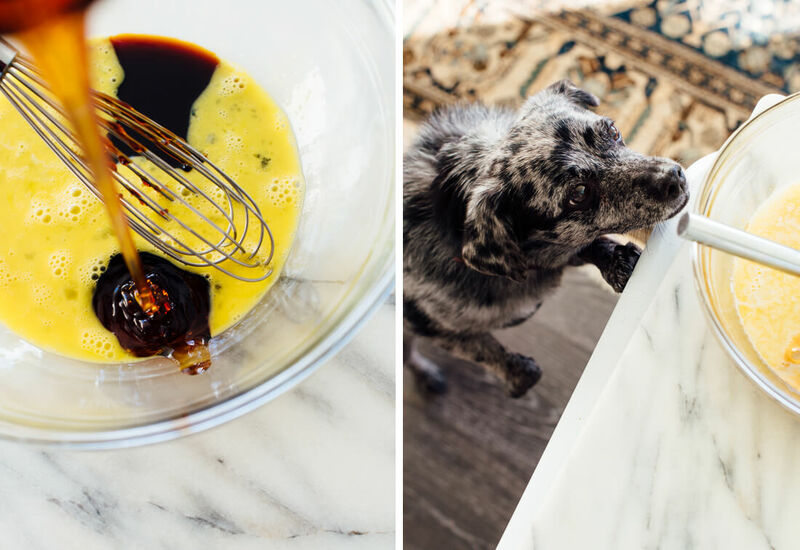 No mixer required! Then I slathered the top with pillowy clouds of cream cheese frosting, because why not? It’s the holiday season. Let’s deck the halls. 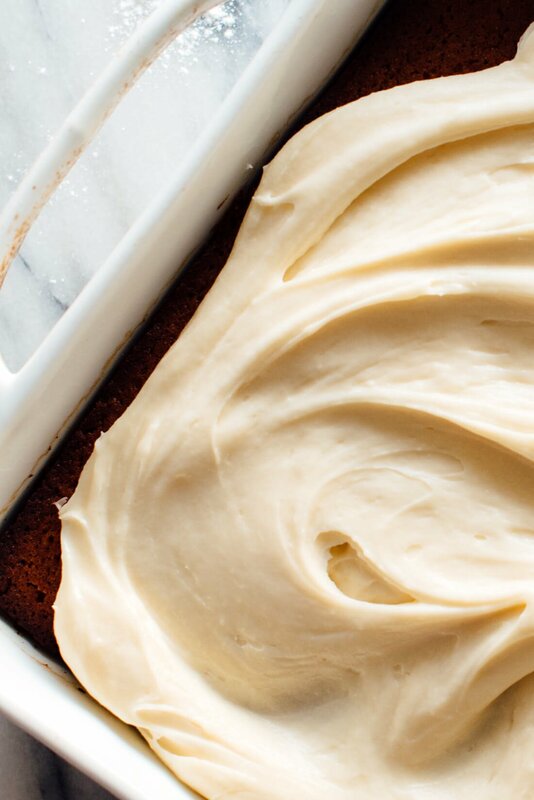 Bring on the cream cheese frosting. Sprinkle cinnamon on top. I’ve received several requests for gingerbread cake over the years, and this one delivers. 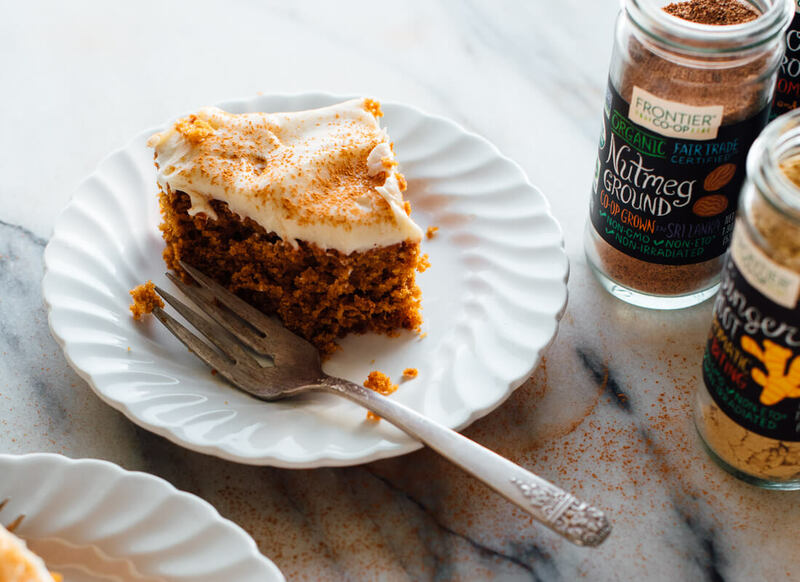 It’s more of a wholesome, hearty cake than a delicate bakery cake, but the frosting balances it all out. I used my partner Frontier Co-op’s spices, which always smell and taste so fresh. Their Vietnamese cinnamon is sweet like snickerdoodles, rather than fiery like Red Hots. Frontier Co-op gets their cinnamon from Northern Vietnam, where a community of farmers harvest cinnamon cut from the case of the tree to ensure a high concentration of oil (and flavor). 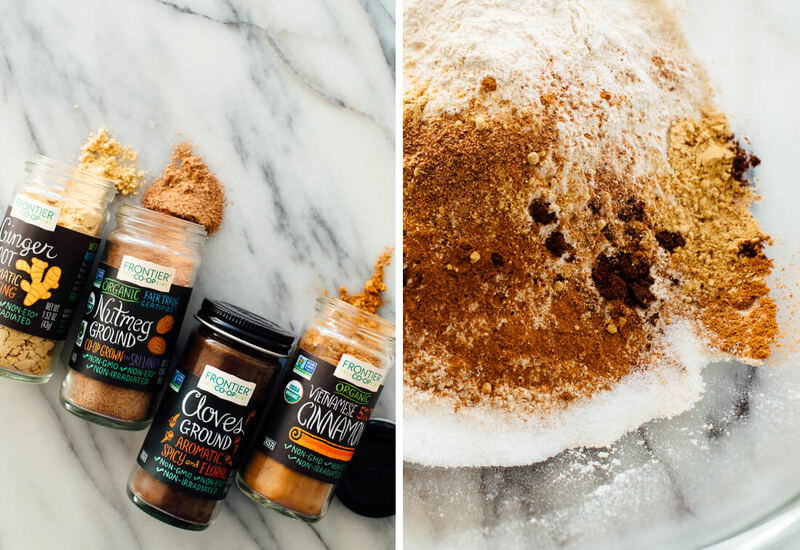 Combined with ground ginger, cloves and nutmeg, this cake is the perfect holiday treat. As always, please let me know how you like it in the comments! 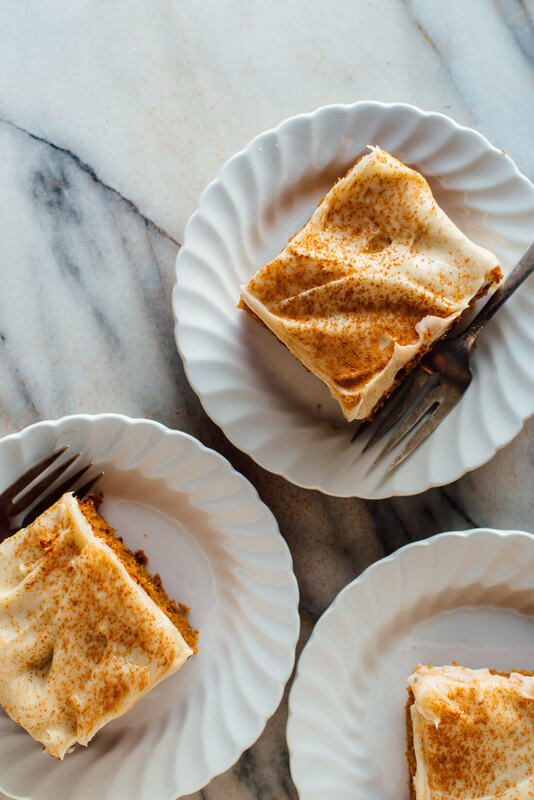 This wholesome gingerbread cake is topped with rich cream cheese frosting. It’s the perfect holiday treat. Recipe yields 9 slices of cake. Preheat the oven to 400 degrees Fahrenheit. Lightly grease a 9-inch square pan. In a large bowl, whisk together the flour, baking powder, cinnamon, ginger, salt, cloves, nutmeg and baking soda. In a medium bowl, whisk the egg until lightly beaten. Add the honey and molasses and whisk until combined, then whisk in the milk and melted butter. Pour the wet mixture into the dry mixture and mix just until combined. Pour the batter into your prepared pan and bake for about 21 to 25 minutes, until the cake is golden brown and a toothpick inserted into the middle comes out clean. Place the cake on a cooling rack and let it cool completely. Wait to make the frosting until the cake has completely cooled. To prepare the frosting: In a medium mixing bowl or the bowl of a stand mixer, combine the softened cream cheese and butter. Using a hand mixer or a stand mixer (or your own strength), beat the cream cheese and butter together until fluffy. Add the powdered sugar and vanilla and stir with a spoon until it is incorporated (or else powdered sugar will fly everywhere), then whip the frosting until it’s nice and fluffy. Spread frosting evenly over the top of the cake, then slice it and serve. This cake is best stored in the refrigerator for up to 4 days. 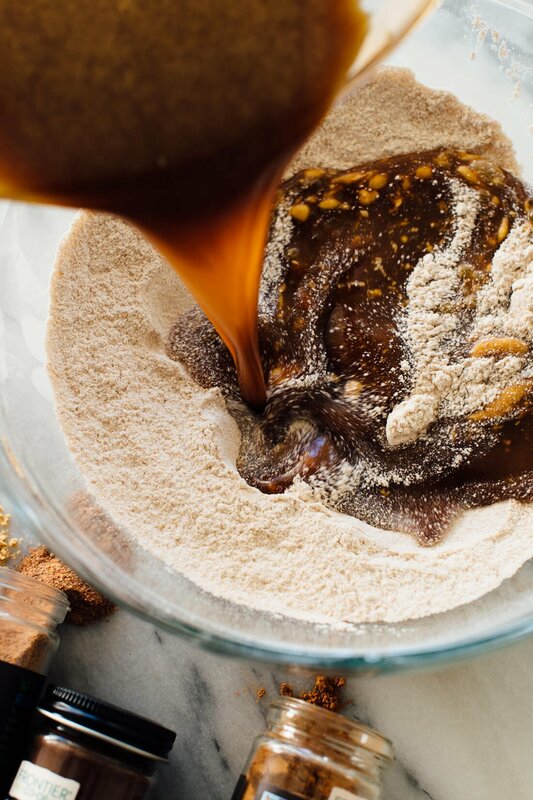 *Molasses note: The strength of your molasses will determine how intensely flavored your cake is. I used regular (not blackstrap) molasses. Make it gluten free: Based on similar cakes, I think you can substitute all-purpose gluten-free flour for the wheat flour. Make cupcakes/muffins: I think you could make 1 dozen muffins out of this batter. Bake at 400 degrees Fahrenheit for around 14 to 18 minutes. While I applaud your use of whole wheat flour, and molasses & honey instead of sugar, I wish you could make this lower in saturated fat. Twelve grams of SATURATED fat in ONE slice? Too much for me. There is not a lot of fat in the cake itself, Jim ^^^ What if you left off the cream cheese icing or used reduced fat cream cheese or just added a dollop of yogurt? It sounds great and I love that it doesn’t use refined sugar! I will make this with a gluten free flour :) Thank you! You’re right, Cecilia. Thank you. My pleasure! Let me know how it is if you make it before I do! Hi Kate – do you think this could be made in a bundt pan? Thanks! Hi Corrie, I’m really not sure, since I rarely bake in bundt pans. You might compare the amount of flour used here to a bundt cake recipe that has worked well for you, to see if they are roughly comparable. Good luck! Hi Kate! I’m writing from Berlin, Germany. We do not have molasses here – is there anything that you could think of that I could replace them with? Yes! I am in Australia and want to know as well as this looks delicious. We have Golden Syrup which is similar or maybe we can use Maple Syrup? Tammy, I’m in Australia and we do have molasses, it’s available in Coles, Woolworths, Health Food Shops, Organic Shops etc. Golden Syrup is pure Sugar not a healthy substitute. Maple Syrup is good but is much lighter in flavour. try Ruebenkraut, which should be available in dark and golden, the dark one being very intense. Grafschafter is a famous brand that makes the best. Can I use Almond Flour instead of Whole Wheat Flour? Hi Dahlia, typically almond flour cannot be substituted 1:1 for regular flour without significantly altering the final product. Your best bet here would be a gluten-free all-purpose flour blend, such as Bob’s Red Mill’s. Hi Kate. Was wondering if there would be any reason why I couldn’t freeze the cake before icing for 2 weeks? Hi Helen, I think that would be ok! If I wanted to make this recipe vegan what would you suggest I use to replace the egg ? This looks so good cannot wait to make this . Thank you in advance. Hi Michelle – I haven’t tried it yet, but you could try using a vegan flax egg. I know you can find these in the store in the health food section or baking section at most grocery stores. I hope this helps! I made this yesterday with my two sons, ages 8 and 6. It was so yummy! Great recipe!! I will make this again. We all had second slices. I did double the recipe and baked it in a 9×13 pan for just over 20 minutes. I made 1-1/2 times the amount of frosting and it was the perfect amount. I also used half whole wheat and half all purpose flour. I would say to be sure not to over-bake this one. I probably baked mine a minute or two longer than necessary. It was still absolutely delicious but I guess I’ve bake enough cakes to know that a few minutes can make a big difference. Thank you:) Just to add, we were initially planning on making speculaas cookies for St. Nicholas day but by the end of a long day that seemed too fussy, so we switched to ginger cookies. Then I saw this recipe in my inbox and thought, hmmm, this sounds even better! So, Gingerbread Cake for St. Nicholas day and a new tradition is born! Happy Holidays!! Happy Holidays, Chris! I am glad you came across this recipe too. It is a tasty one. Thank you for your detailed comment and for your star review! Thank you yes that helped. What a gorgeous cake! I wish I could find a vegan gingerbread cake. 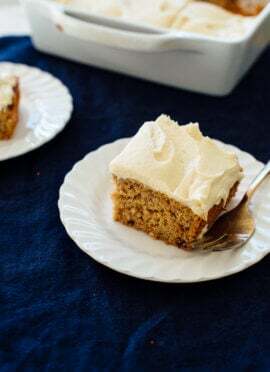 I’m sure there are plenty of substitutions you can make with this recipe–maybe even use vegan cream cheese for the frosting too! Cassie, I like to use Kite Hill products when the recipe calls for yogurt, cream cheese, ricotta, etc. They are almond-based and are delicious! Thank you! And yes, there are some vegan alternatives you could try based on your experience. Sugar, spice, and frosting?! I’m in! Great! Let me know what you think when you try it, Abby. Great cake! The whole family enjoyed, thanks! Love to hear that, Lisa! Looks so delicious! I can’t wait to try it! Let me know what you think, Lizzie! 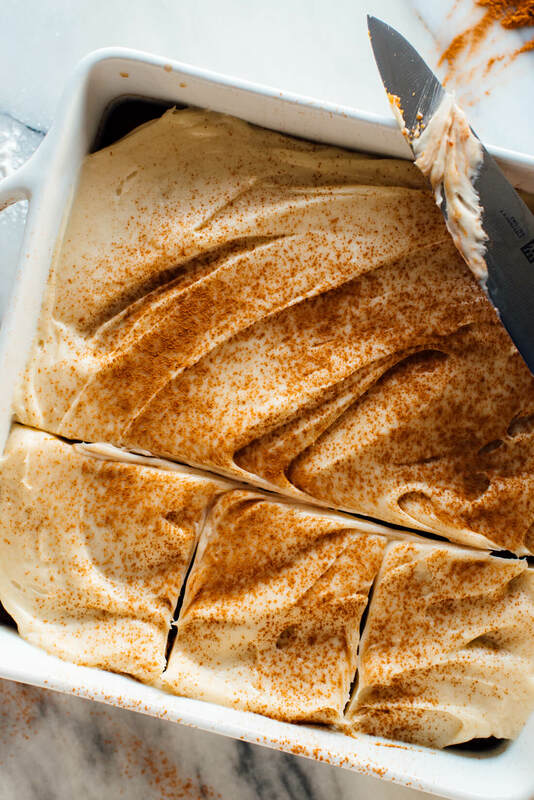 You had me at no mixer…(and cream cheese frosting, but that was a given)! Well, I came here to tell you I recommended your cookbook in my article on which books to gift this holiday season, and was completed sidetracked by this salivating over this gorgeous cake. Imma make it for the in-laws. If you’d like to check out the article, published in the Singapore American Newspaper this month. Thanks for keeping me well fed this year! Happy Holidays! Gingerbread is my favorite, and I am dying to make this. But my son is allergic to honey. What would be a good substitute? Love your cookbook – use it all the time! Do you see any problem subbing WWPastry flour for the reg WW flour? Thank you. I think it will work! Your cake might be a little delicate, but I don’t foresee any big problems. Hi, regarding the powdered sugar for the frosting, can I use icing sugar or should I use regular table sugar? Many thanks! Hi Cindy, you need to use fine/fluffy powdered sugar, not regular granulated sugar. Hope that helps. Do you think there would be an issue if these were baked in muffin tins? The cook time would be less but other than that…? Made this last night with blackstrap molasses. I didn’t make the frosting but added golden raisins. Perfect breakfast/snacking cake that way, especially since I’ve cut most of the white sugar and flour out of my diet. I love it! Thanks for a great recipe! I’d definitely make it again, might try olive oil instead of the butter next time and maybe add some bittersweet or unsweetened chocolate chunks instead of raisins. This looks so delicious! A different take on a classic holiday flavor…I’ll have to try it when I get home from college after finals :) I have a quick request… could you do a take on creme brulee for a recipe sometime? Thanks so much for all your wonderful recipes…I cook for my family when I’m home, and I always use your recipes. Everyone loves them! I followed the recipe as is and baked it for 21 minutes, while the cake was delicious it was dense and a bit dry. Any thoughts on what I could have done wrong? Hi Merri, this cake is more hardy than fluffy-like-a-bakery cake. I think that’s just the nature of baked goods made with molasses. I made 3 of these cakes for a party at work and there was not a piece left! Everyone loved it. Very moist, deeply flavored and not overly sweet (the cake). Great recipe. Love, love! Thank you, Pattie for trying the recipe and for your review. I appreciate it! this cake was great! Just an fyi to anyone who wants gluten-free cake, I used paleo baking flour by bob’s red mill (it’s a 1:1 ratio when substituting) and the cake came out more dense/less fluffy than normal cake but was still delicious! It also might’ve come out more dense than usual because I accidentally added a whole stick of butter instead of 3/4 stick. 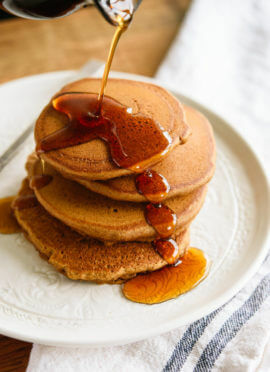 I used blackstrap molasses and it added a stronger flavor which we like. I appreciate the note! I love hearing how gluten-free substitutes work for my readers. Thanks so much for your review, Jaimee. I made this cake for a party and tragically forgot to buy the powdered sugar for the frosting. The cake itself however was delicious and ended up being a HUGE hit, so I can’t wait to make it again with the frosting! Thank you, Kim for the review! We were going to make gingerbread and now that we saw this we are going to make this instead-YUM! Also many thanks for your new cookbook,we preordered a bunch for birthday presents and they were such a hit we ordered a bunch more for Christmas-that was easy shopping and everyone including us LOVE your book.Happy Holidays to you and pats to Cookie! Your forest friends in Ontario Canada,Marg Eric and wags from our pooches Phoebe and Rosie PoseyPS.We regularly make your rosemary shortbread both gluten free and regular and they are a total hit!Thanks for that too!! Thanks so much for your support! I really appreciate it. Happy holidays! Made the Gingerbread cake per recipe. Looked good, smelled good, but cake was very crumbly and a cut square did not hold it’s shape when plated. What went wrong, how can we make it moist and hardier? Hi Karol, I’m sorry to hear that! I’m not sure why that happened, since I made this cake several times and never encountered those issues. How do you measure your flour? I use the spoon and swoop method—spoon the flour into the cups, then level with a knife. If you scooped flour directly into the cups, you can end up with a lot more flour, which might explain your issues. This looks incredible. I can never resist cream cheese frosting! Definitely on my “to try” list (which is rapidly growing this holiday season). Let me know how it goes, Katherine! I made your chocolate chip cookies without the chocolate chips, subbing in raisins for a vegan guest. Next time I am going to sub in some oats and reduce the oil slightly. My son has eaten many a dry vegan cookie happily munched through several of these;his girlfriend was the vegan at the table. Made this Christmas treat for my family last night, I was worried when the batter tasted extremely bitter, but after baking the cake it turned out DEVINE. It was not too sweet, but it was moist and seasoned deliciously, with a perfect frosting balance. This is a completely delicious recipe, thank you Kate! Will make this one a tradition. You are welcome! I’m happy it turned out well for you, Lillian. Kate, I made the gingerbread for Christmas and it is delish. Even better the next day as the flavors intensify. Nice that it is still healthier than most desserts too. I love that about all your baking recipes- so thank you! It was late last night, and I decided to cut one (or two) pieces of the gingerbread. Lily my mini doxie came a calling for crumbs… she loved it too. Thanks for another great recipe and enjoy the cocktail posts throughout the season as well. Love to hear that, Jill! And you are very welcome. I thought it would be a fun change-up. I appreciate the review. Fantastic! Thank you, Lea. I appreciate the review! I love your blog. I check it regularly and make your Healthy Granola all the time! This cake is absolutely amazing and everyone who tried it agrees! I didn’t have ground ginger, so I substituted 2 Tbsp fresh ginger. It was so moist and delicious. I will be making this one again. Thanks Kate! You’re welcome! Thank you, Angela. OK seriously? This cake is SO delicious. 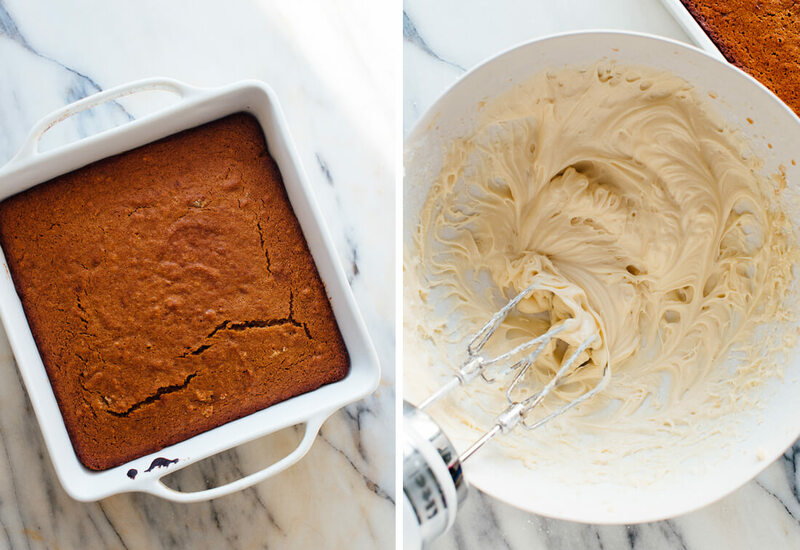 I didn’t even make the frosting – just dusted the cake with powdered sugar & it was so great. I usually follow your recipes to a T because they are all awesome, but this time i happened to use regular AP flour, blackstrap molasses, and salted butter because it’s what I had, PLUS i was out of cloves. Ha! It was STILL great. My 2 year old gobbled it too! I was surprised by how perfect the texture of the cake was! Thank you so much for your recipes. I always look to your site first when we’re craving something specific or when I just want to try something new. Thank you! I’m so glad you think so. I appreciate your review and for sharing. My name is Ellie, I am ten years old. I this so much!!!!! I have backed it for my family a few times and they loved it!!!! Me and my mom love to cook and we use you recipes a lot !! We love your food! You’re sweet! Thank you, Ellie. hi there, sorry but this cake was a disaster. hard, had to slice it off…was in for 19 min y the way, and a whole cup of cream cheese???? ?half was jus perfect…..may I ask didyou make this cake as printed…I truly doubt it…..cake was dry and rubbery.i might add I ve been baking all my life(60 years)soooo disappointed! Yum. I added some oats and some crystallized ginger (I rinsed off the exterior sugar to reduce the sweetness a little), as well as a little black pepper. I did have to adjust the liquid amounts slightly but I already have to make a number of adjustments to adapt to baking at 7000 ft. so it was no big deal. I also left off the cream cheese frosting, even though I love it, to reduce the calorie count. It was quite tasty on its own, though I imagine a dollop of whipped cream would also be nice. I might decrease the honey next time since the crystallized ginger adds significant sweetness, but I loved the bite.